The Toronto Maple Leafs announced a two-year, $1.575 million extension for rookie forward Trevor Moore. The Toronto Maple Leafs announced a two-year, $1.575 million extension for rookie forward Trevor Moore on Sunday. The deal will pay the Thousand Oaks, CA native $775,000 in the first year and $800,000 in the second. Moore, 23, has appeared in six games with the Leafs this season, tallying a goal and two assists. 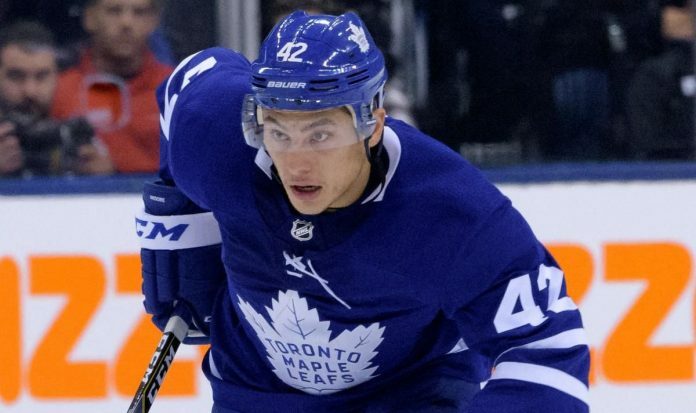 The majority of his season has been spent with the American Hockey League’s Toronto Marlies where Moore has 19 goals and seven assists in 30 contests. Moore originally signed with the Leafs as an undrafted free agent out of the University of Denver in 2016. In his first year as a pro, Moore was a member of the Marlies’ Calder Cup-winning squad.